If you're wondering how the much-discussed internet of things will actually affect your everyday life, one simple answer would be smart tech. And this doesn't only mean sophisticated systems implemented by big business and governments to improve national infrastructure and drive data production, as the 'smart home' phenomenon is also on the way for our households. Explaining more about the trend, and how the multi-vendor QIVICON alliance is helping to shape it, Head of Connected Home at Deutsche Telekom Holger, Holger Knöpke answers our questions. TechRadar Pro: So what do we need smart home products for? Holger Knöpke: Can you imagine a world in ten years where your car is not smart? I can't. Along the same lines, I also cannot imagine a world in which your home is not smart. The benefits in terms of energy savings, more security and convenience are just incredible. It will be a while before smart home offerings come into their own, and now, no obstacles stand in the way of a smart home breakthrough. There is, for one, the increasing prevalence of smartphones and tablets, and high availability of broadband Internet connections. 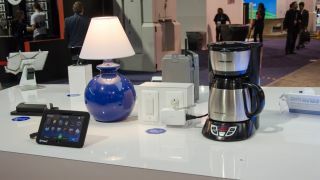 For another, the prices of smart home products are falling continuously. Many other factors also play a role. Take, for example, the "energy revolution" that is making consumers think more and more about how they can save energy. Further, demographic changes are a factor: with an ageing population, more and more older people would like to lead independent lives in their own homes for longer. Here too, smart home products can be a great help. TRP: How large is the smart home market? HK: By 2017, Deloitte predicts that smart home solutions will generate European revenues of more than £3.25 billion, while Berg Insight anticipates that the smart home market in North America will grow by 42 per cent to a volume of £5.6 billion. TRP: How does the QIVICON platform differ from other offerings for the connected home? HK: The smart home market is characterised by many solutions that are not compatible with each other. If a user buys one provider's smart home product he can only, as matters stand, use its functions and solutions and not those of other manufacturers. Our approach is radically different. We have developed a technical platform that is open, multi-vendor and on which any company can offer solutions, regardless of the industry to which it belongs. We currently have 33 partner companies. By the end of the year there will be about 50. So QIVICON is already the smart home platform with the world's largest number of partner companies. The result of this variety is a unique pick-and-mix smart home. QIVICON will revolutionize the smart home. For this innovative approach and its technical implementation QIVICON has already won several awards and we are increasingly seen as the innovation leader in this field. TRP: Could you explain this with an example? HK: QIVICON is both a B-to-B product and a product for end consumers, so it's B-to-B-to-C. An example? Some Smart Home solutions only enable the user to manage one application, such as lighting or heating. With QIVICON, in contrast, you can connect the entire home. You can combine your central heating, electrical appliances, windows, blinds – whatever you like – it can be done. So QIVICON adds an entirely new dimension to the Smart Home: easy-to-use management for an unlimited variety of Smart Home solutions. QIVICON is a uniform basis for total home control that combines partner companies' products. Consumers using the QIVICON Smart Home platform will find more and more solutions that they can control simply and comfortably via the QIVICON home base.